Time for an epigram from Heraclitus, the world's first creativity teacher (he lived around 500 BC). I like him because he's cryptic and he makes me think. 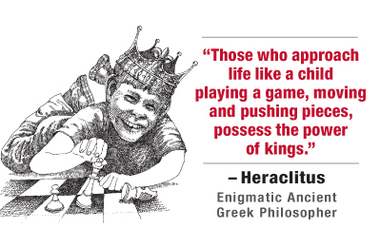 Since my past several posts have dealt with "thinking like a kid" and "education," it's only fitting that today's epigram is: "Those who approach life like a child playing a game, moving and pushing pieces, possess the power of kings." Take a moment to ponder what these words mean for you. Here are three examples of how this strategy get the creative juices flowing. Rosalind Franklin, the scientist whose crystallography research was instrumental in the discovery of the structure of DNA, was asked why she pursued her studies. She replied, "Because our work is so much fun!" Similarly, Murray Gellman, the physicist who coined the subatomic-term "quark" after a line in James Joyce's Finnegan's Wake, was asked to comment on the names of the various types of quarks -- "flavor," "color," "charm," "strange," etc. He said: "The terms are just for fun. There's no particular reason to use pompous names. One might as well be playful." Finally, the renowned chair designer Bill Stumpf was once asked what criteria he used to select furniture projects. He responded, "There are three things I look for in my work: I hope to learn something, I want to make some money, and I'd like to have some fun. If the project doesn't have the promise of satisfying at least two of these, then I don't sign on." Ask yourself: How can I crank up the "fun" element in a current project?